You may remember a couple of years ago I built a train-set for my son. He's gained a couple of locos and some wagons, but for a recent birthday we gave him some more track, and also another train set (a second-hand bargain from a show) for Christmas. 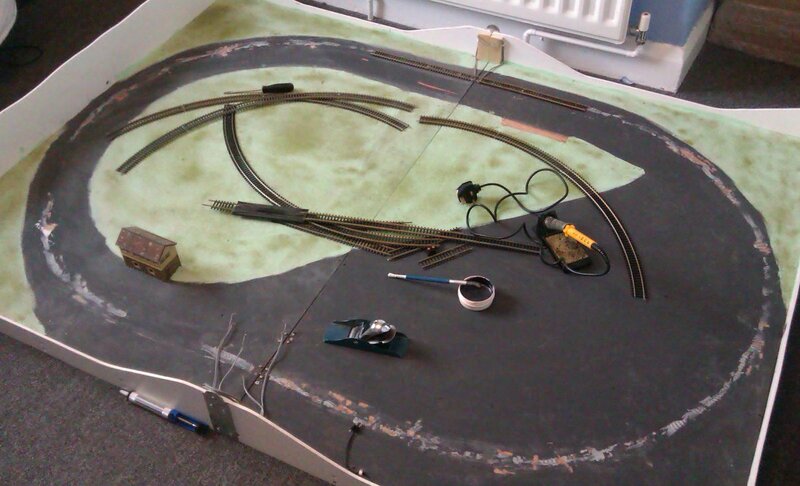 This means a bit of work adding a second circuit to the board, but this is the season for train sets. First job was to remove the existing track. It was laid in the garage in November 2010 when the temperature was well below zero, as a result when brought in the house the rails expanded, although the track didn't move the curves had a negative camber! When released the diameter of the oval expanded by about a quarter of an inch. I then had to plane off the no-more-nails type glue, as it hand't worked well, this time I stuck to track pins. 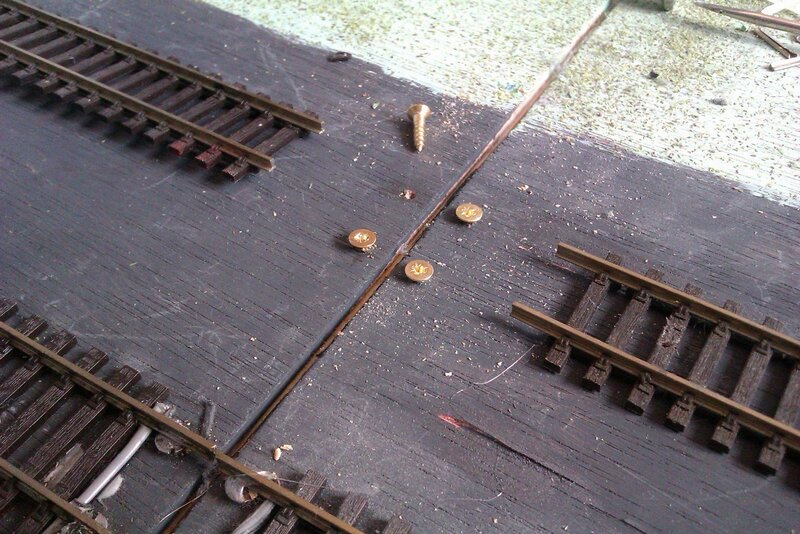 Hint: Hornby pins are larger than PECO, but strong enough to go into plywood. The job was made more complex because of the folding board, this means the track needs to be cut at the board joint and soldered to small brass screw heads to ensure secure alignment. Also every rail needs a wire to bridge the gap, laid above the board because of the double-skin board design. Further complications are that Hornby and PECO have different geometry for their curved points (I was using various points bought cheap at shows or off ebay), and the size of the board didn't allow two standard straights between curve and board joint. This restricted point placement, and meant I couldn't use the power feed tracks - I just wired back to a terminal block connector for easy connection of controllers. This shows the final layout, as you can see I had allowed for the extra tracks when I painted the board, and there was space for the outer platform and siding. I Think I got the maximum number of tracks on for maximum fun! All points are within reach of one side of the board too. With two controllers I can now play with my son! Some of you may know Mike Beard, who has been describing on the NGRM-Online forum the re-build of his own Egger coaches, a more extensive rebuild than I have tackled. 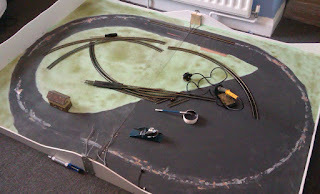 He mentioned to me a while back that he was looking at 3mm Scale Model Railways products for detailing the coaches. But it was a pleasant surprise to find a pair of brake handles in a Christmas card - thanks Mike! Of course coaches like this usually did have brake standards on their balconies. They didn't take much fitting, and as you can see from the rather poor photo below, they do add more interest to the end of the coach. The size is spot-on too, so Mike was onto something looking at 3mm scale, but surely the poor 3mm scale people would need a stepladder to put the brakes on? This time of year brings many distractions from modelling - half term, family visits, a child's Birthday and party to organise, and of course the big day later in the month that seems to require so much preparation! So progress with the Skylark has been in stops and starts, but here's where I'm at anyway. The Kato chassis I am using has quite a low profile, but the boiler casting is cut away to clear a motor, this was just visible as there is a gap between the tanks and the boiler. So I filled the gap with plasticard, then stuffed the boiler with lead. I've also cut out the opening on the inner tank side to match the outer, and spaced the sides with plasticard - there was about a 15-thou gap along the tank top. The sides were filled with lead too. As you can see the cap side openings have had the "door" removed (the prototype did not have a door) and the edges chamfered. Preparation of the parts like this does take time, but once assembled on the chassis it is worth it. The cab rear has also been extended below the bunker with plastic. The cab is quite visible so I will have to make some representation of the firebox and backhead. Side-on the arrangement of the side skirts, tiny inclined cylinder, and the "pony" wheel appearing under the rear frames, all seems to work quite well. The trailing wheel should be behind the cab step so it is a bit too far forward, but it looks OK. The tank fillers require a rounded handle on top, however I thought they looked better upside-down with the locating peg filed to a rounded shape- see the one in the foreground, than on the left is unmodified. Another job was to drill out the chimney top. The chimney was a pig to get vertical, even after a long time adjusting the fit with a small file. 5-minute epoxy does give time to check it from all angles as the glue sets, using a square, even so I think it might not be quite right! Exciting news from the Warley show at the NEC today, PECO have launched a range of ready-to-run 009! They've chosen the Lynton & Barnstaple as the prototype, and a pair of wagons (a van and an open) will be available in the new year. Coaches will follow later in the year. There has been much speculation about this on the forums recently after rumours leaked out, so it is great to see there was truth behind them! However I've been thinking for some time that RTR 009 was becoming more and more likely, these days production runs appear to be much more viable at lower volumes and a substantial collectors market has fuelled all sorts of rare prototypes being produced for the main scales. Warley also saw more RTR "O" gauge announced, with sub-£300 locos, this would have been unthinkable a few years ago. While the majority of products are aimed at the steam-diesel British Rail era, I think there are an increasing number of modellers without nostalgic links to standard-gauge steam, and the range of subjects for model railway layouts is widening all the time. For many their experience of railways (especially steam ones) is based on preserved lines, books and other media, and that can just as easily mean narrow-gauge. I'm sure interest in NG has increased in recent years with plenty of NG models in the magazines and at exhibitions. 009 offers a lot to modellers: the detail and scenic scope of 00, but with compact trains and sharper curves allowing a decent layout in a small space (just look at mine!) - ideal for a home layout. It is also easy to add a narrow-gauge "feeder" or tourist attraction as an aside to a larger 00 layout, and for collectors (for whom running models is not important) 009 models can sit alongside 00 in the display cabinet! You may be thinking - why the excitement, these are just wagons and coaches, but surely many are put off 009 by the need to kit-build locomotives? That is very true, although the Roco and Minitrains products could make a convincing preservation-era layout with these products. However I think we have a chicken-and-egg situation here, manufacturers will have been put off 009 for fear that a loco would not sell without suitable stock to pull. Now PECO are denying they are looking at making a loco, and to be fair making locos is something PECO rarely do, but there are still rumours of an RTR loco being a possibility. I'm more confident of that than ever, if the new releases sell well then surely manufacturers will look at 009 from the saturated 00 marketplace and think there is an opportunity! Meanwhile, hats off to PECO for a brave move, and I wish them well. I'm sure there will be some wagons on my wish list next year, the coaches may be too long for Awngate - but they do look nice! The Dave Brewer Challenge at EXPO NG this year was for a "Pizza" layout, that is one of no more than 2 ft (60cm) in any direction. These generally result in a simple circle of track (I don't recall if that was a stipulation), hence the "Pizza" label! As you will have no doubt figured out already, I'm a big fan of these challenges, and like micro-layouts generally. However I'll admit that Pizza layouts don't generally hold a great appeal to me, they can be tricky to make realistic and can be rather predictable, I see their main purpose to serve their builder; as an exercise, experiment of new scale or technique, or a useful test track. That is not meant as a criticism of the genre, just that I find part of the appeal of micro layouts is the challenge of an interesting and workable track-plan fitted into a realistic setting, the Pizza has less scope for this. This year though the challenge entries were of the usual high standard, and demonstrated some original ideas and superb skills. The winner of the challenge was Southern Cross Sand & Cement, by Des Trollip. 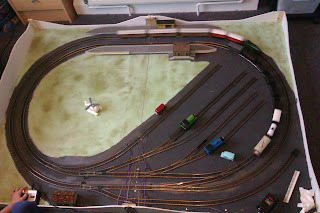 This 009 layout features a sand and cement plant (as the name suggests), and with a siding and a spur off-scene it could be described as a fully operational layout. However it is the detailed industrial buildings and plant, and well observed colouring, that makes the layout stand out. Train Set for Christmas by Daniel Figg caught my eye as being particularly original! It uses a dolls-house scale of 1:12 (I think) with "T" gauge - the Japanese produced 3mm gauge trains. I reckon that is around O gauge to scale? I believe this won a Junior Award. Inspired! Chapel Mills is a well modelled and somewhat more typical pizza in 009 by Chris Seago. 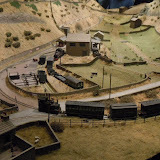 However my favourite, and a layout I have watched the development of on the NGRM-Online forum, is Four Seasons in O9 by Chris Dack. The name is taken from a type of pizza of course, but Chris has taken it literally - and modelled the same scene in each of the four seasons. I admire his dedication in this - I'd be bored by the second scene! He has really captured each season well - check out details such as the level of the river, and the size of the log pile, as well as the colouring and scenery. Chris has even mounted the circular layout on a motorised base - the viewer can press a big red button, which makes the entire layout rotate to the next scene. That's enough of a menu I think. Slow progress on the Skylark but hope to have an update soon. The bottom of the corner posts fits into "feet" on the steps, which should appear to be extensions of the end frame of the chassis. The tops of the wire corner posts bend through 90 degrees under the roof, they then bend downward into a piece of plastic fixed into the inside of the coach body. The photo below shows the recesses cut into the underside of the roofs to clear the wire. I'm pleased with how the look with the roof on, and they certainly seem well attached - even at this stage, without glue. I'm still to deal with the spikes, they will be removed and replaced with a plastic strip representing a wooden handrail. Also visible above is my "prototype" step. The original steps were too fragile and long gone, so I need something more sturdy, this "solid" plasticard step (which doesn't show up well in the pictures) is certainly solid, the issue is ensuring sufficient bogie clearance. With some trimming of the end of the bogie and careful position of the points the coach is easily able to negotiate 12" radius Peco points, so it looks like this should work.